It can be really hard trying to get – and stay – in shape. Your body is adjusting to your new regime, and it can feel like hunger can strike at any time! Usually this coincides with an energy slump mid morning or mid-afternoon, when it’s all too tempting to reach for something sweet and crunchy lurking in the cookie jar! 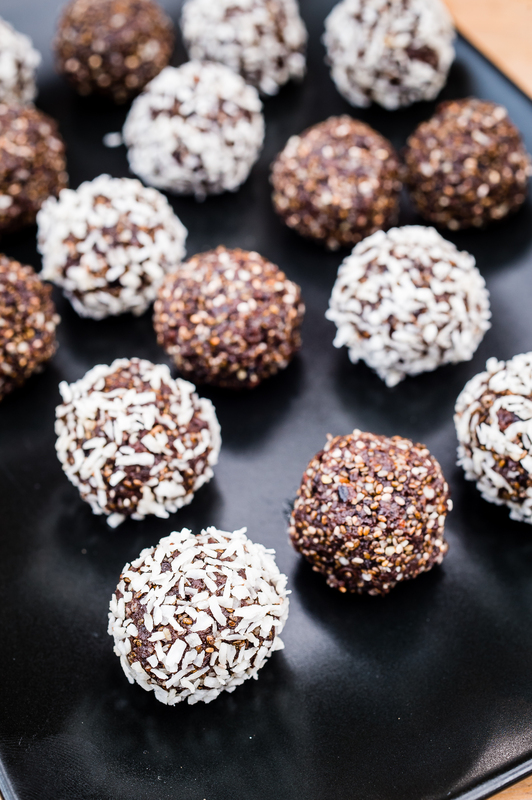 These are the perfect alternative – healthy, tasty, and packed with energy. The nuts give you a protein and energy fix, which will sort out the low-blood sugar levels which are causing your energy slump. Most people think that you need a sugary snack for this, but this is a common misconception – in fact all that happens is that you’ll get an immediate sugar “high” and half an hour later you’ll be back in the slump. Slow-releasing energy and some protein is what you need, and a portion of fibre and natural sugar – which you get in spades with the delicious prunes. This recipe makes about 20 balls, so you’ll have no excuse to listen to the biscuit box calling you! You will need a blender / food processor for this recipe. Place the nuts in the food processor and blitz for a moment. Add the other ingredients, save for the coconut oil and desiccated coconut, and blend well, until smooth. Add a small amount of coconut oil, a few drops at a time, until the mixture is sticky, and holds its shape when you roll a small amount between your fingers. Take a tablespoon of the mixture and roll into a ball, and continue until all the mixture is used. Place a handful of desiccated coconut onto a plate and roll the balls in it, to coat, if using. Jennifer Irvine, who has written two books, ‘The Diet for Food Lovers’ and ‘Pure Package The Balance Diet’ is also owner of both Balance Box and The Pure Package, nutritious food delivery services which include a raft of celebrities amongst their clientele – from Hugh Jackman to Denise Van Outen. Jennifer is also the mother of four beautiful daughters. A leading voice in the healthy eating domain and a self-confessed lover of prunes, Jennifer has helped the California Prune Board develop a series of inspirational light recipes featuring prunes and prune juice, both of which offer significant nutritional and proven health benefits.